Finalizing - Finishing the spray paint bike project! Almost done with the spray paint job, everything is pretty much done. Just need to peel off the stencils and unmask the entire bike. Make sure to leave the head tube, bottom bracket and seat tube sealed. After you get everything off the frame, you’ll be spraying it down with a clear sealant. NOTE: Be careful when peeling back the tape and stencils. You run the risk of ripping the new paint if you move to quickly and carelessly. Peel the adhesive stencils back carefully. There are multiple layers of spray paint sitting on top of the stencil. If you go fast you can rip pain off. Also, be careful when you wet sand the final paint. You’re wanting to mildly scuff the surface so the clear enamel binds to the paint well. You don’t want to strip any paint off! The clear enamel used for this project is on the left. Again, make several passes with the clear enamel. This will dry hard and be part of what protects your paint! I did so many passes that I actually emptied the whole can on the bike. Whether you are painting a road bike or a mountain bike, you will have rocks and road debris flying at your frame. Too many coats is probably not enough here! The painted frame, with clear enamel, pre-assembly! Some other thoughts and stuff.. 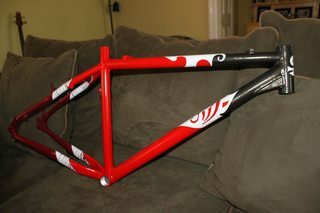 While you go through the process of painting your frame, you’ll end up with a lot of waiting time on your hands. 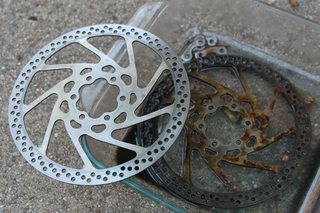 If your using any components off an older bike, I’d recommend you take the free time and clean those components. I cleaned my cassette, scrubbed old rust off my disc brakes and cleaned my rear derailed while I was waiting for coats to set in between. 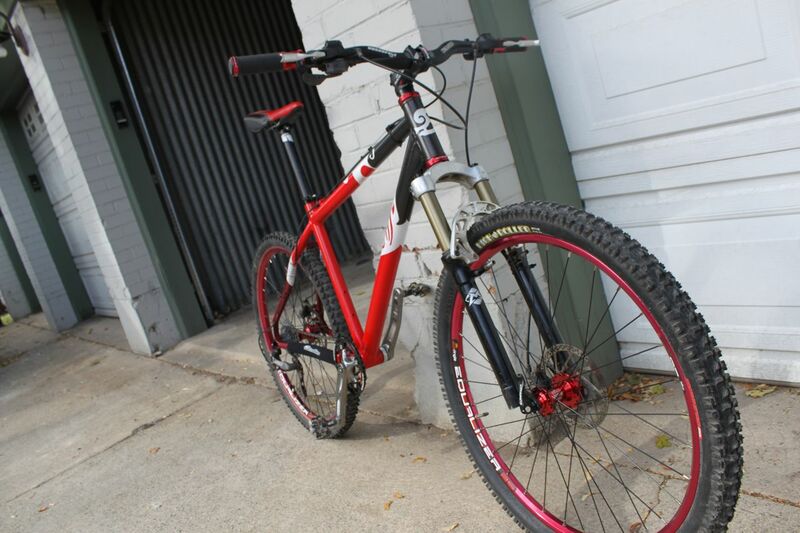 It ends up giving the final bike a very polished look… even if it is a spray paint bike! Clean those wheels, remove and scrub that cassette! Hmm.. aluminum sheen or rust? What goes better with the red theme? In my case, it was short lived. It is after all, a mountain bike. Below is the final, assembled product and probably the only day I will ever see this bike this clean. And there she is in all her beauty! I finished the spray paint bike project about 6 weeks ago. Since that time, I have taken the bike on a ride once or twice a week. I ride some pretty rough and rocky trails. For those of you familiar with Salt Lake, I regularly run this down the Bobsled Trail. I’m actually surprised how well the pain has held up! There hasn’t been any rips in the paint. It’s taken on a few dings.. but honestly, it’s nothing I’ve never seen on a factory powder coated bike! Next time I need a new frame, I think I may repeat this project! 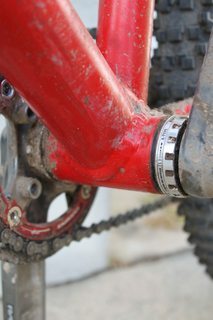 The bottom bracket. There is paint still there! I have more pictures of this project if you just want to thumb through them. I tried to give you as much detail as I could. Here is the project gallery that is hosted on imgur.com, one of the most awesome image hosting companies around! Thank you for taking the time for posting this!!! I’m about to start a restoration painting project on an old cruiser bike. I’m really intimidated by the stencil work that’s required (I can’t just paint over that stuff, I wish my conscience would let me…) but I’ll figure it out seeing examples like you’ve shown. Thank again! Yea, sure!! I’m glad at least one person got some use out of this project! i really like the string thing you did – really effective. Love all of this. Can you elaborate on the thread thing? How did you make sure it all had contact with the frame? Also, if I wanted to blend from one color to another on a big top tube would this be to ambitious with the thread method? With the thread, I just wrapped it tightly. I think you could probably do a nice gradient blend if you wanted. I would suggest doing a couple of trials on a spare piece of tube or wood and see how evenly you can make a gradient. I think the real challenge is making it look clean. I actually wanted to do a gradient but ended up steering away from it because spray paint is harder to control than a paint gun that a pro would be using to paint a bike/car/motorcycle. thanks alot man! this has helped me loads! Top marks mate, not only is it a stonking looking bike it’s completely unique, very impressive. I’m looking to restore a clapped out road bike into a single speed, and I will definitely be using your tutorial to do my own paint job. Hopefully I will have a quality finish like this. Good job – inspiring work. Thanks very much, this site is great, exactly what I needed, great work. Thanks for this awesome step by step guide. 🙂 It will really help me in getting my 11 year old bike painted with some unique colors. this is a cool little site mate, well done. just attempting to restore an old yeti hard tail that someone has vandalised with gloss black paint!! hate the prep’ing part as im very impatient but its got to be worth it in the long term. again thanks for putting this up and your bike looked really good!! im thinking of spray painting a small jump bike i used to use and was thinking of using enamel spray paint. so if i did would i have to use primer before using the enamel??? Hey, thanks for the site – its great. I just tried to paint an old univega frame I wanted to turn into a single speed. I read your site and some other and went at it. I made some mistakes and now I want to figure out how to fix… I only used 2 coats of primer – waited about 20 minutes between each thought that would be enough – maybe not. and i should have used more i think. I sanded between primer and color. I only put down 2 coats of color I did it all on one day. I started outside but here in san fran area of cali. it got really cold by end of day and i had to move the bike indoors so i let it dry about 1 hrs between the primer and the color and only about 40 minutes between color coats. 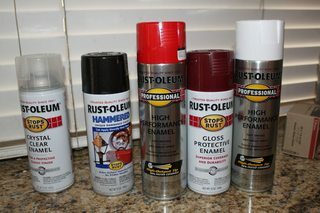 Then I waited just 2 days before the clear coat- the can said less than 2 hrs between coats or longer than 2 days – so i thought this really said i needed to get it all done in one day – other people i read had problems with the same effects when waiting – but i think i just need to wait longer right? – you did not have these issues? i tried to use very light clear coats but i still got alot of running and more over I got alot of surface “bubbling” with the clear coat and in one small place on seat stay w second color coart – so thoughts -can i just sand off the clear coat – wait longer and color coat again 2 or 3 more coats 30 minutes apart- and wait longer like a week before the clear coats? I had the some of the same issues with running paint. I had to go back and sand over those areas and redo. (see this: http://185.56.85.246/~spraypa6/painting-tips/ ) I found that it works best making sure you hold the can at a solid 12 inches from the target and do light passes. It’s easier to make a few more passes than it is to clean up heavy runny areas. As far as bubling, that is usually a result of painting in weather that is too cold (try to paint in 60-85 degree weather). It could also be cheap paint or the paint is actually on too thick. Brilliant little site! I’ve sprayed a couple of frames and the outcome has differed depending on the time and effort used. One thing I’d like to add for anyone attempting a paint project is this; if you’re doing it in an outdoor building like a garage or a shed, it’s better to wait for warmer weather. I live in England and our winter’s are pretty bitter. Me and my friend sprayed a frame in his garage but the cold weather caused the paint to go tacky. I’m sure about the science behind this but when I’ve sprayed in summer I found the paint dried quicker and more efficiently. Thanks for taking time on this site, it’s really useful! Yea, good point. I should go back and make that note. Another guy said basically the same thing.. From the research I’ve done, it seems that 60-85F (15-30C) is the ideal temperature for painting. Hey, I’m starting a BMX recon very soon. 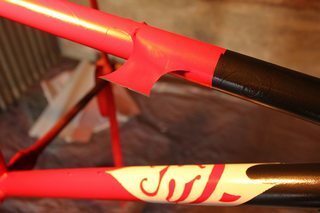 I’ve looked on all sorts of sites for techniques on frame prep/paint/finalizing and none of them are as good or offer as much guidance and advise as your. Glad I came across this site as its really going to help me get the finish I’m after. Cheers dude, Joe. That’s a very nice paint job! Next time to strip old paint try to use KWIK airplane paint stripper. Great gob overall! This stuff is really going to help me with the sprayjob I plan to do…as I have no idea where to start. So now I know what to buy and how to prepare etc. 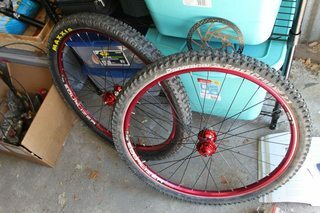 Used your methodology of painting on an old ’92 Giant Rincon that I turned into my SS MTB rig (fairly light now too! ), and it turned out wonderfully. Thanks for the write-up! Very cool! Glad my write-up helped. Awesome article. Well done, and thanks for taking the time and effort to put up. Hope you’re still enjoying the beast :). Thanks for this, just pulled apart my ~40 year old custom built road bike gifted to me by my father in law a few years ago. It’s in pretty good shape despite the age, miles, and surprising amount of original components, my regular ride. Finally time for a rebuild and paint job, perfect article, thanks again.